We’d love your help. Let us know what’s wrong with this preview of The Great Passage by Shion Miura. Inspired as a boy by the multiple meanings to be found for a single word in the dictionary, Kohei Araki is devoted to the notion that a dictionary is a boat to carry A charmingly warm and hopeful story of love, friendship, and the power of human connection. Award-winning Japanese author Shion Miura’s novel is a reminder that a life dedicated to passion is a life well lived. To ask other readers questions about The Great Passage, please sign up. Did anyone else disagree with the style of the translation? I understand it's almost impossible to translate passages that deal with subtleties of Japanese words. As a once-translator, i empathize. However, on the other hand, if i could understand the Japanese words, i wouldn't be reading the book in translation, so leaving so many of them there is a distraction that doesn't add to the enjoyment of the book. Mike _____As a non-Japanese reader with no experience in translation myself, it hadn't even occurred to me that there would be multiple ways to have…more_____As a non-Japanese reader with no experience in translation myself, it hadn't even occurred to me that there would be multiple ways to have navigated this decision. I thoroughly enjoyed reading the book and didn't experience any awkward pauses in confronting the Japanese words. My assumption was that the Japanese words were left in because the word itself was the subject of discussion and also out of a respect for the subject matter, similar to the idea of calling it Firenze instead of Florence, or calling someone Juan instead of John. Kohei Araki has worked on dictionaries for all of his life and has a deep love for words and their various meanings. With his impending retirement, Araki must find a replacement to work on the dictionary that he has helped to start, an ambitious project undertaken by a department that is understaffed and underfunded. He soon meets Mitsuya Majime, discovered by another one of the staff members, who's quirks and eccentricities make him ideal for the job. I'm not sure if it's because this book is a Kohei Araki has worked on dictionaries for all of his life and has a deep love for words and their various meanings. With his impending retirement, Araki must find a replacement to work on the dictionary that he has helped to start, an ambitious project undertaken by a department that is understaffed and underfunded. He soon meets Mitsuya Majime, discovered by another one of the staff members, who's quirks and eccentricities make him ideal for the job. I'm not sure if it's because this book is a translation, but I had a hard time getting into it. The characters were definitely amusing and I enjoyed the relationship between Masashi Nishioka and Majime the most. It was actually really great to see Nishioka's growth and though he's kind of a douche his relationship did make me smile, especially when he realizes he loves her and eventually seems to get past his previous emphasis on more shallow things like looks. Other than that though I did get bored while reading this book at a lot of parts. I especially was annoyed at the jump in years that felt like it came out of no where and when the new character, Midori Kishibe, is introduced. Wrapped up in the main story about the creation of the dictionary there are three different stories about the people in the dictionary department. One is about a man who learns to connect with people, one is a woman who learns not to judge others, and the other is about a man who learns that it's ok to show that you care about things. The translator has done a great job. There is a lot of discussi How can a book about a small department at a publishing house creating a dictionary be so wonderful? The translator has done a great job. There is a lot of discussion about the meaning and origin of words and I'm impressed by how these have been translated from the original Japanese to still make sense in English. A couple of times I had to re-read paragraphs a few times to follow the meanings, but the majority of them were easy to follow. I enjoyed this a lot more than I expected to. It made me smile while I was reading it and even though the ending has some sad moments it left me happier and I'm glad I took a chance on it. A dictionary is a ship that crosses the sea of words. Words and the human heart that c A dictionary is a ship that crosses the sea of words. Words and the human heart that creates them are absolutely free, with no connection to the powers that be. Warning: While I don’t go into many plot details, there are a few lines that hint at some developments. So, those wanting to know nothing about character development can consider this a slight spoiler warning. A while back I started my review of The Nakano Thrift Shop with the following: “This is the type of book that pretty much all my friends would expect me to hate, but that I always love. A slice of life novel, more on the humorous than serious side and with little to no plot. Strange for som Warning: While I don’t go into many plot details, there are a few lines that hint at some developments. So, those wanting to know nothing about character development can consider this a slight spoiler warning. I begin again with that as I can pretty much copy/paste the exact same reaction here. I find that Japanese literature captures slice of life moments better than any other country I’ve read. It’s the combination (for me at least) of mundane life, but with the added twist in all the ways Japanese lifestyle is different from my own (as someone from the US). The little differences are fascinating, and the major ones even more so. This novel, from what I gather, was a huge success in Japan. After its release, it had both a film adaptation and an eleven episode anime adaptation; both of which were received fairly positively around the globe (though I confess I have not seen either yet). The plot follows the staff of a publishing house as they work on creating a new dictionary, The Great Passage of the title. It’s a multi-year project, and staff comes and goes as the dictionary takes shape. Though the main story follows the progress of the dictionary, we get many side stories along the way. From newcomers to the project and their reaction to the rest of the office, to people leaving and following their last days on the project. Through these almost short story chapters we get to see the lives of our cast evolve. Life goes in many directions for them, and I’d be lying if I said some didn’t work better than others from a plot standpoint, but all around it leads to some well-developed characters. The best of these characters, in my opinion, is Majime, who starts off as a new editor in the department at the beginning of the novel. He’s a character I related to a bit more that I was probably supposed to. He enjoys company, but finds it difficult at first to associate with his co-worker, and can more often than not be found with his nose in a book. "No matter how poor he was at communicating with people, with books he could engage in deep, quiet dialogue." His plot is thoughtful, and we see the most development from him… though thankfully the book never tries to “fix” his personality, and his flaws remain consistent. One area of this book I must praise is how it treats its cast. It’s a common cliché to have academics be humorous, stuffy characters. This book avoids that completely, with one of the early scenes of the novel being a professor and an editor discussing their first dictionaries and joking about how the professor never looked up “dirty words.” While the novel is not an outright comedy, there are many of these humorous moments of dialogue that humanizes the characters and keeps them far from the classic academic cliché. I find it hard to find many flaws in this novel, as it does pretty much everything it sets out to do successfully. The funny bits are genuinely amusing; the emotional bits succeed and feel earned. If I had to come up with something, I would say that the character of Kishibe changes a bit too fast. It seemed almost as if her attitude towards the job flipped as I sat the book down for the night. I get that there was a time-skip, but it seemed to happen a bit too fast. But that is a very minor complaint. "Gathering a huge number of words together with as much accuracy as possible was like finding a mirror without distortion. The less distortion in the word-mirror, the greater chance that when you opened up to someone and revealed your inner self, your feelings and thoughts would be reflected there with clarity and depth. You could look together in the mirror and laugh, weep, get angry." Words are powerful tools and The Great Passage wields them well. Cuốn sách nói về những người làm công việc biên soạn từ điển, nghe đã thấy chán, cộng thêm cái tiết tấu kể chuyện đều đều chậm rãi kéo dài suốt 20 năm mà chờ hoài chẳng thấy tiến lên chắc hẳn sẽ khiến ai đó thiếu kiên nhẫn nản lòng. Thế nhưng, "Người đan chữ xếp thuyền" lại khiến tôi đọc không dứt ra được, câu chuyện tưởng chừng không có chút gì hấp dẫn lại khiến tôi cảm động bởi cái sự giản dị của nó, cái cách tác giả kể câu chuyện một cách chân tình, không có cảm giác loè loẹt tô vẽ đã đi vào l Cuốn sách nói về những người làm công việc biên soạn từ điển, nghe đã thấy chán, cộng thêm cái tiết tấu kể chuyện đều đều chậm rãi kéo dài suốt 20 năm mà chờ hoài chẳng thấy tiến lên chắc hẳn sẽ khiến ai đó thiếu kiên nhẫn nản lòng. One of the benefits of owning a Kindle and having an Amazon Prime membership is that they give you a free book each month (from a selection of six). This month, I downloaded The Great Passage and was pleasantly surprised at its depth and sincerity. If you had told me that I'd enjoy reading a book about writing a dictionary, well I'd probably believe you. But this book is so much more than that. The Great Passage has two primary themes: the complexity of language and being passionate about a proje One of the benefits of owning a Kindle and having an Amazon Prime membership is that they give you a free book each month (from a selection of six). This month, I downloaded The Great Passage and was pleasantly surprised at its depth and sincerity. If you had told me that I'd enjoy reading a book about writing a dictionary, well I'd probably believe you. But this book is so much more than that. The second theme Miura explores is how it feels to be truly passionate about something. In this story, the members of the team are all devoted to seeing the creation of their dictionary through to the very end. And that kind of enthusiasm can be infectious when shared correctly. Even for doing something like reading through definitions of thousands of words, if you love the work, it will be truly enjoyable. And it's more than just enjoying the work itself. If the people around you are enthusiastic and help teach you their joy, you can partake of it too. "Awakening to the power of words—the power not to hurt others but to protect them, to tell them things, to form connections with them—had taught her to probe her own mind and inclined her to make allowances for other people’s thoughts and feelings." "He says that memories are words. A fragrance or a flavor or a sound can summon up an old memory, but what’s really happening is that a memory that had been slumbering and nebulous becomes accessible in words." Đọc xong cuốn này tự dưng có cảm hứng đọc từ điển :)) . Trước giờ dùng từ điển hoài nhưng chưa bao giờ thắc mắc xem chúng được tạo ra như thế nào . Đây là một trong số ít những cuốn sách mà mình ưng cái tựa . Rất giàu chất thơ . Tuy cái bìa không hiểu sao cứ làm mình liên tưởng hoài đến ngôn tình . :)) . Đây là cuốn sách lý tưởng của những người yêu ngôn từ vì nó nói về một đám người ngộ chữ tối ngày bơi trong những con chữ :)) . Trong truyện mình thích nhất là Nishioka , tuy lúc nào cũng bị m Đọc xong cuốn này tự dưng có cảm hứng đọc từ điển :)) . Trước giờ dùng từ điển hoài nhưng chưa bao giờ thắc mắc xem chúng được tạo ra như thế nào . Đọc cuốn này xong càng thấy khâm phục thêm tinh thần của người Nhật , làm việc không mệt mỏi và là những perfectionist đích thực <3. A fascinating and entertaining story of a small group of dedicated people who worked over 15 years to produce a new Japanese dictionary. I especially enjoyed the sections where there was a debate about a specific term or word, which highlighted the nuances of the Japanese language, are truly gobsmacking. I now fear writing any word knowing how easily the meaning could be misunderstood. The complexities of producing a Japanese dictionary including the five proofs, type of paper, editing to fit def A fascinating and entertaining story of a small group of dedicated people who worked over 15 years to produce a new Japanese dictionary. I especially enjoyed the sections where there was a debate about a specific term or word, which highlighted the nuances of the Japanese language, are truly gobsmacking. I now fear writing any word knowing how easily the meaning could be misunderstood. The complexities of producing a Japanese dictionary including the five proofs, type of paper, editing to fit definitions on a page, choosing which words to include or not, maintaining currency of words all made the book a fascinating read. The book also was a feel good story as it delved in the editor, his staff, and their relationships to show that lexicographers may be oddballs but are people with immense skills, quirky personalities and an attention to detail that is formidable. I downloaded this book with using the benefit of "Kindle First" in May 2017. I was curious how it is translated into English, since this book cannot be discussed without Japanese words and phrases. Brilliant!! The translation is so great and flawless. I read this one with both in original Japanese and the translation, the feel is the same. I want to recommend this book to all the non-Japanese people, and I would like to hear what they think!! However much food you ate, as long as you were alive, you would experience hunger again, and words, however you managed to capture them, would disperse again like phantoms into the void. A beautifully written book that makes me wish that I could read and understand Japanese to truly appreciate the masterpiece that this is. In Japanese like English, words have many different meanings and we rely on things like context to give us clues. This book follows several people in a department trying to make However much food you ate, as long as you were alive, you would experience hunger again, and words, however you managed to capture them, would disperse again like phantoms into the void. In Japanese like English, words have many different meanings and we rely on things like context to give us clues. This book follows several people in a department trying to make a dictionary. Words have a vast number of meanings, so to define words in a way that is relevant and useful to its users is a struggle, but with all these words at our disposal it is still hard to find the right ones for any situation. I enjoyed the journey this book took me into the "sea of words" and I recommend it for anyone who loves "words" as much as I do. Where does the title come from? 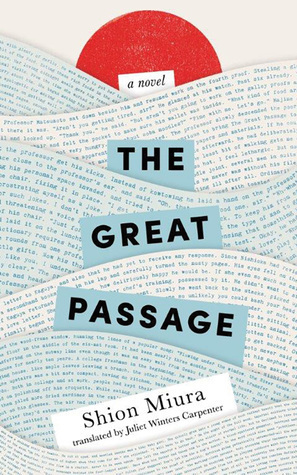 The Great Passage is the dictionary the book's lexicographers are writing. Japanese dictionaries apparently have much more interesting names than those in English: Wide Garden of Words, Great Forest of Words, and Great Sea of Words are three of the more interesting names of the real dictionaries cited. It's also a great passage for Majime, the book's central character, who is transformed over the course of the book from a geeky, awkward man, the sort of man that inspires others to want to kick sand into his face, to Director of the Dictionary Editorial Department. Imagine Clark Kent and Superman. If Superman was a nerdy lexicographer. Kishibe had a similar experience: Awakening to the power of words—the power not to hurt others but to protect them, to tell them things, to form connections with them—had taught her to probe her own mind and inclined her to make allowances for other people’s thoughts and feelings. (pp. 156-157). A quiet read but fascinating for its peek into a slice of Japanese culture I was unaware of--a fondness for dictionaries. The Great Passage traces the work and lives of employees of the fictional Gembu Dictionary Editorial Department. It is about passion, for words, language and craft. Passion that spans a lifetime. Words are necessary for creation. Kishibe imagined the primordial ocean that covered the surface of the earth long ago--a soupy, swirling liquid in a state of chaos. Inside every person there is a similar ocean. Only when that ocean was struck by the lighting of words could all come into being. Love, the human heart...Words gave things forms they could rise out of the dark sea. A dictionary is a repository of human wisdom not because it contains an accumulation of words but because it embodies true hope, wrought over time by indomitable spirits. I wondered if it was true this reverence for dictionaries. My daughter queried her Japanese friends and found that indeed personal dictionaries are a thing in Japan and apparently widely used. Her friends related how as students in Japan they kept a dictionary handy to look up words they didn't know, and now find them vital for studying in the US. Her roommate keeps one front and center on her desk. Tiểu thuyết Nhật đầu tiên của mình! Các bạn có bao giờ tự hỏi là trên một tủ sách tập hợp tất cả các loại sách thì cuốn nào là ... cô đơn nhất không? Đúng rồi đó, từ điển cô đơn nhất. Nó không có được sự lôi cuốn theo mạch truyện của truyện trinh thám, không có được những tình tiết dựng tóc gáy của truyện ma, và càng không có được những khoảnh khắc lãng mạn của ngôn tình, tiểu thuyết lãng mạn... Từ điển - một tập hợp toàn chữ và chữ, đôi khi là hình minh họa (bây giờ đã có từ điển tranh ảnh) thì Tiểu thuyết Nhật đầu tiên của mình! Các bạn có bao giờ tự hỏi là trên một tủ sách tập hợp tất cả các loại sách thì cuốn nào là ... cô đơn nhất không? Đúng rồi đó, từ điển cô đơn nhất. Nó không có được sự lôi cuốn theo mạch truyện của truyện trinh thám, không có được những tình tiết dựng tóc gáy của truyện ma, và càng không có được những khoảnh khắc lãng mạn của ngôn tình, tiểu thuyết lãng mạn... Từ điển - một tập hợp toàn chữ và chữ, đôi khi là hình minh họa (bây giờ đã có từ điển tranh ảnh) thì mở cuốn từ điển ra ta chỉ có ném lại nó một cụm từ : vừa nặng vừa chán. Ta chỉ tìm tới từ điển khi thực sự bế tắc trong việc cắt nghĩa một từ trong tiếng mẹ đẻ hoặc ngôn ngữ thứ hai, thứ ba chúng ta đang theo học. Còn không, cuốn từ điển nặng như chì ấy sẽ bị vứt vào xó cho đến khi đóng bụi. Bụi sẽ càng dày hơn trong thời đại số, các app từ điển trên smartphone cũng như các trang web từ điển online miễn phí đã trở nên thông dụng. Cô đơn lại càng thêm hiu quạnh ! Thế nhưng, cuốn sách "Người đan chữ xếp thuyền" cho tôi một cái nhìn khác, một cái nhìn nhân văn hơn và trân trọng hơn với từ điển bởi đằng sau tập sách dày cộp toàn chữ ấy, chính là bao công sức. tâm huyết, thời gian, sự hi sinh cá nhân thầm lặng cho đam mê của một người hay một nhóm người quyết chí cống hiến cho đại dương ngôn ngữ bao la vô tận. Cuốn sách kể về một nhóm người biên tập từ điển và nhân vật chính là một anh chàng có cái tên nghe phát biết luôn tính cách: Majime (tiếng Nhật có nghĩa là siêng năng và cũng có nghĩa là nghiêm túc). Ở anh hội tụ các phẩm chất phù hợp với công việc biên soạn từ điển. Sau khi được phát hiện ra tố chất và thuyên chuyển công tác về Phòng biên soạn từ điển, hành trình gian khổ làm nên cuốn từ điển Daitokai của anh Siêng Năng bắt đầu. Cũng từ đó, tác giả tường tận vẽ ra cho người đọc thấy từng phân đoạn nhỏ trong quá trình biên soạn từ điển nó khó khăn và gian khổ như thế nào trong 15 năm trời. Từ những việc nhỏ nhặt như note các từ vựng mới vào thẻ mẫu câu, sắp xếp thẻ, soạn bản thảo, ngoại giao với các giảng viên ngôn ngữ nhờ họ giúp hoàn thành bản thảo, đọc morat, sửa morat, kiểm duyệt, làm bìa, thương thảo với công ty giấy để chọn ra mẫu giấy "cực phẩm" phù hợp với quyển từ điển ( đây là phần làm mình hứng thú nhất), cân bằng ngân sách , và cả những vấn đề như bị đì, bị dị nghị cho việc làm từ điển quá tốn kém tiền bạc các kiểu ... Nếu quyển sách chỉ có thế thì nghe qua sẽ cực kì chán vì chả khác những video How It's Made trên channel khoa học phải không? Cái làm nên sự khác biệt cho cuốn tiểu thuyết này chính là tác giả đã thổi hồn, những tâm hồn sinh động, nhân văn và đậm chất văn hóa Nhật Bản vào trong những nhân vật phải làm những công việc cực kì nhàm chán, khô khan ở Phòng từ điển. Vượt qua những đặc điểm tẻ nhạt, dở tệ trong giao tiếp, và có phần hơi lập dị mà người người vấn gán cho các thành viên làm công việc biên soạn từ điển, suốt ngày cắm mặt vào các con chữ, thì ở trong sâu con tim họ đó là những ngọn lửa luôn cháy bỏng khát khao làm bạn với từ ngữ để một ngày họ có thể dừng từ ngữ truyền tải tâm tình mà bấy lâ bị nén kín vì những hạn chế trong giao tiếp, cho người họ quan tâm, yêu thương. Cũng từ đó, cùng sự phát triển mạch truyện, những tình cảm hết sức mộc mạc, chân thành giữa người với người được vẽ nên qua những hành động từ nhỏ nhất cho tới thiêng liêng vô cùng. Từ cái nháy mắt đáng yêu của bà chủ nhà Take, cho tới tập thư tình độc nhất vô nhị của ông ngố Majime, hay là bữa ăn khuya hiếm hoi của đôi vợ chồng Majime - Kaguya, hay bức thư cảm ơn đầy xúc động của thầy Matsumoto... Tất cả những chi tiết ấy, làm nên 2 cuốn từ điển lớn đáng ngưỡng mộ. Một cuốn từ điển quốc ngữ Nhật Bản Daitokai dày 2900 trang và một cuốn từ điển về tình người dày 384 trang. Nhận xét ngắn về cách dịch của dịch giả Nguyễn Kim Hoàng: cực kì thích cách dịch này vì khi đọc cá nhân mình thấy không có dấu vết của việc chuyển ngữ mà như thể đây là do một tác giả người Việt viết vậy. Mình nghĩ đây là điều làm mình ưng nhất ở bản tiếng Việt của cuốn sách này. Holy flipsicles, this is probably going to be one of my favorite books of the year, and I literally stumbled across it on accident. I was looking around NetGalley for my "second" (the real second title was a bust) title to review, and I liked the description of this book, so I picked it up. The book is narrated by multiple characters, each story revolving around the creation of The Great Passage, a "comprehensive 2,900-page tome of the Japanese language." My favorite narrator is by far Mitsuya Ma Holy flipsicles, this is probably going to be one of my favorite books of the year, and I literally stumbled across it on accident. I was looking around NetGalley for my "second" (the real second title was a bust) title to review, and I liked the description of this book, so I picked it up. The book is narrated by multiple characters, each story revolving around the creation of The Great Passage, a "comprehensive 2,900-page tome of the Japanese language." My favorite narrator is by far Mitsuya Majime. He is completely scatterbrained but passionate about his work. First, I love quirky people who have really complex thought processes and people who seek to examine the world through a different lens. Some of the thoughts in this book resonated with me as things that I think about, but can't figure out how to express. It was really refreshing to hear people talking about how lonely a Ferris Wheel is, or wonder about things like "What if the interior of a room mirrors the interior of its inhabitant?" "Thinking is no problem, but conveying my thoughts to other people is hard for me. The simple truth is, I just don't fit in." THIS. IS. ME. Also, all of the main characters are well rounded. You get to peek into their lives and see what goes on behind the scenes of the dictionary work. The plot isn't very complex, you're literally following through the entire creation of the dictionary to publication, but I was enamored by the everyday lives and thoughts that the characters had. I really liked the plot itself - the making of dictionaries. However, the way book handles the important topics such as love, attitude to work and friendship is really naïve. It's a good Sunday read, but unfortunately even though it talks so much about the beauty and meaning of works, the way it's written is just okay. There is quite a lot of attention placed on human interactions - be it between the boss and the employee, between co-workers, between lovers, but the way it's described just made m I really liked the plot itself - the making of dictionaries. However, the way book handles the important topics such as love, attitude to work and friendship is really naïve. It's a good Sunday read, but unfortunately even though it talks so much about the beauty and meaning of works, the way it's written is just okay. Considering the topic of the book, words fail me to adequately describe it. The creation of a dictionary and the team of individuals it took to manage the undertaking provides amusing and entertaining reading. For me it was a delightful departure from my usual choice of book. Thay vì nói đây là câu chuyện xoay quanh Majime, chi bằng nói đây là một câu chuyện của những con người, những tấm lòng cùng nhau làm nên một quyển từ điển. Mạch truyện mở đâu hơi chán, vì tâm lý ngay từ đầu lại nghĩ từ điển thôi mà, sao lại có thể phát cuồng vì nó đến vậy? Chưa kể tác giả còn lồng vào mấy cái quy trình của công việc biên tập từ điển, trong 100 trang đầu mình đọc thật sự mệt. Kiểu, mọi thứ cứ đều đều, không có cái gì để mong chờ. Nhưng mà càng về sau, mình nghĩ mình đã bị cảm hoá. Thay vì nói đây là câu chuyện xoay quanh Majime, chi bằng nói đây là một câu chuyện của những con người, những tấm lòng cùng nhau làm nên một quyển từ điển. Nhưng mà càng về sau, mình nghĩ mình đã bị cảm hoá. Cảm hoá bởi lòng nhiệt thành, nhiệt huyết và sự nỗ lực bền bỉ của tất cả nhân vật trong truyện. Trải qua 12 năm học phổ thông, đến khi tốt nghiệp cấp 3 rồi, quay đầu nhìn lại, mình thật muốn thở dài một hơi. Nhưng mà, tưởng tượng được không, làm một quyển từ điển kéo dài 15 năm. Là gần hai thập kỷ. Tuổi xuân con người được bao lâu, đời người được bao năm. Vậy mà những con người này thật sự dùng 15 năm cuộc đời mình để làm ra một quyển từ điển bằng tất cả nhiệt tình, chuyên nghiệp, sự cẩn thận, tỉ mỉ. 15 năm này, họ cống hiến trọn vẹn. Rồi cũng trong 15 năm này, có những chuyện này chuyện kia xảy ra cũng khá đáng yêu, có mấy chuyện tình ngốc ngốc, có anh chàng kia từng bước trưởng thành, có anh chàng nọ tìm được hạnh phúc. About as deep as a puddle an hour after a brief spring rain, this is still a very sweet and moderately engrossing novel. Miura clearly spent a lot of time learning what lexicographers do and the technical bits of her book are surprisingly interesting, although some of the specifics are inevitably lost due to the vast differences between Japanese and Western orthography (same with some of the puns and misunderstandings that occur between characters because of too rigid notions of language-the tra About as deep as a puddle an hour after a brief spring rain, this is still a very sweet and moderately engrossing novel. Mua sách vì ấn tượng cái tên của nó, "Người đan chữ xếp thuyền". Đọc xong mới thấy thực sự tâm đắc với cái tên này, quá phù hợp với câu chuyện vềnhững người làm biên soạn từ điển cũng như tình yêu sâu sắc của họ với ngôn ngữ. Điều đó được tác giả diễn tả một cách nhẹ nhàng, chân thực mà vô cùng cảm động. Nhìn bìa thì có vẻ như là truyện tiểu thuyết lãng mạn , thế nhưng, tuy rằng có lồng ghép các chi tiết về chuyện tình cảm của các nhân vật nhưng nó không phải là điều chính làm nên giá trị tác ph Mua sách vì ấn tượng cái tên của nó, "Người đan chữ xếp thuyền". Đọc xong mới thấy thực sự tâm đắc với cái tên này, quá phù hợp với câu chuyện vềnhững người làm biên soạn từ điển cũng như tình yêu sâu sắc của họ với ngôn ngữ. Điều đó được tác giả diễn tả một cách nhẹ nhàng, chân thực mà vô cùng cảm động. Nhìn bìa thì có vẻ như là truyện tiểu thuyết lãng mạn , thế nhưng, tuy rằng có lồng ghép các chi tiết về chuyện tình cảm của các nhân vật nhưng nó không phải là điều chính làm nên giá trị tác phẩm. Short, adorable story with quirky characters. The author is very descriptive about the process of dictionary making and clearly has done her research. For my taste, there was a bit more about the dictionary process than required and I would have liked more of the interaction among the characters. Beautiful cover. At the 20% mark, I'm finding it stilted & boring. Time to stop. A good story with some spoilers of other books. I dislike it when authors do this to one another. Beware of it if you like Natsume Soseki's books, because you get the ending of it in this novel. Cuốn sách của lòng đam mê, nhiệt huyết, vượt qua mọi khó khăn để hoàn thành ước mơ, tình yêu với ngôn từ. Surprising relationships emerge out of the recondite labors of a team of dedicated lexicographers editing a new comprehensive dictionary dubbed THE GREAT PASSAGE (Dai tokai). The minutiae of new entries to consider, old entries to be re-evaluated, etymologies to be verified and mini-encyclopedic nuances of usage to be detailed are surprisingly appealing in the hands of this author. Such details consume the characters in this book 24/7. Is it possible that such an obsession can fill the deep-seat Surprising relationships emerge out of the recondite labors of a team of dedicated lexicographers editing a new comprehensive dictionary dubbed THE GREAT PASSAGE (Dai tokai). The minutiae of new entries to consider, old entries to be re-evaluated, etymologies to be verified and mini-encyclopedic nuances of usage to be detailed are surprisingly appealing in the hands of this author. Such details consume the characters in this book 24/7. Is it possible that such an obsession can fill the deep-seated yearnings of a lifetime? Shion Miura communicates her passion for words with unexpected persuasiveness in this quiet novel. She animates her characters with beguiling curiosity, not only about language, but the way they view themselves and their connection to the world. The dictionary is “a ship bearing the souls of people traveling from ancient times toward the future, across the ocean rich with words.” (p.200) Past, present and future lives are connected by the restless transformation of words. Miura's characters are not complicated; the paradoxes she considers are planted in her narrative. Professor Matsumoto advises his staff to combine intellectual with experiential learning in editing the dictionary. Yet, he admits, having spent most of his life in academics and publishing, he has little experience of the world. Mitsuya Majime is a scrupulous investigator of words. Yet, he admits to himself that thinking is easier than speaking; his problems communicating might actually be a powerful motivation for his interest. The novel is divided into five sections, each section shifting in viewpoint. These shifts deepen our sense of emotional depth in the characters. The book opens with an aging Kohei Araki recalling the moment he received his first dictionary. It was a graduation present when he was an adolescent. He developed a critical and appreciative eye: “...the book as a whole was the result of people puzzling over their choices. What patience they must have, what deep attachment to words!” (p.3) After 37 years of labor, his retirement looms. His spirits lift when he believes he has found the ideal successor to fill his position. The candidate is at first glance an unlikely choice. Mitsuya Majime is an awkward shy misfit in the publishing house's sales department. He cannot even pour a glass of beer without slopping it over the rim due to his nervousness. Chapter 2 follows Majime's development from self-conscious neophyte to empathetic professional. His own commitment encourages a relationship with Kaguya Hayashi who aspires to be a master chef. Chapter 3 opens from the point of view of Nishioka, Majime's cocky gregarious colleague. It is an interesting shift because up to this point he has been depicted as a shallow-thinking slacker. Chapter 4 shifts to yet another character, Midori Kishibe, whose struggle to fit in is depicted in tandem with severe bouts of dust allergy. Much of the charm of this book is due to its subtle sense of humor. At a staff get together at a nearby restaurant, Araki tries to kick Nishioka under the table to curb his inappropriate joking: “Majime let out a yelp. Someone had just kicked his shin. Across the table, Araki was glaring at Nishioka, apparently trying to tell him to knock it off. He must have aimed at Nishioka's shin and kicked Majime by mistake.” (p.39) An ongoing joke riffs off a turgid love letter Majime writes. It is filled with obscure characters and classical Chinese poetry so vague that not only must Kaguya struggle to translate it, even then she is unsure what he means. Thanks to the efforts of the translator, Majime's issues over word meaning take on unexpected drama. For example, he struggles with the distinction between 'noburu' and 'agaru'. Both were verbs meaning 'to ascend', but they were not used interchangeably. These passages certainly must have had added liveliness for Japanese readers. The pace of this book is slow but rewarding. The setting is in the pre-digital era when work was organized on files and files of index cards, and the printed product was an aesthetic masterpiece. Through their work, each character stumbles on an epiphany of self-revelation. The author no doubt hopes that the reader will encounter the same feelings about language from reading this book. “Gathering a huge number of words together with as much accuracy as possible was like finding a mirror without distortion. The less distortion in the word-mirror, the greater chance that when you opened up to someone and revealed your inner self, your feelings and thoughts would be reflected there with clarity and depth. You could look together in the mirror and laugh, weep, get angry.” (p.143) Words matter. This was a free offering through the Kindle Prime program. It was a pleasant surprise to find such a hidden gem. This was a sweet, engaging book, but I think it probably lost a lot in translation. There was a lot of word-play which probably would have been very clever in the original Japanese but lost something in having to be explicitly explained. Definitely an enjoyable read though, and the insights into the process of creating a dictionary were very interesting. An unexpected delight. This is a book about a dictionary editing team and their long endeavor to publish a new Japanese language dictionary. It doesn’t seem at first brush like it would be a compelling premise, but that in part is what made it so fun as I went through. The characters in the book fall broadly into two camps - the one, normal folks who don’t give a second thought to how a dictionary is compiled, and find those who obsess over such things to be off-kilter. The other, those who obse An unexpected delight. This is a book about a dictionary editing team and their long endeavor to publish a new Japanese language dictionary. It doesn’t seem at first brush like it would be a compelling premise, but that in part is what made it so fun as I went through. The characters in the book fall broadly into two camps - the one, normal folks who don’t give a second thought to how a dictionary is compiled, and find those who obsess over such things to be off-kilter. The other, those who obsesss over such things. Fifteen years are spanned from the start of the book to the finish as it describes the dedication and work involved by both camps alike. The characters themselves are not the sort of people you might expect to find at the center of a novel, and yet they blend together in a sort of awkward dance. I mean that in a good way - it’s really fun to read. None of the interactions are predictable, but they make sense, and further, you get to see how the relationships in the book evolve, and how the characters themselves grow as well. Right, so, the narrative is unambiguously hilarious at points, but what makes it a great book is that the story itself is interesting and, particularly towards the end, surprisingly emotional. At the heart of it, it’s a story about what happens when you pour your heart and your soul into a single endeavor. And so, it’s inspiring. Shion Miura (1976–) , daughter of a well-known Japanese classics scholar, acquired her love of reading at a very young age. When, as a senior in the Faculty of Letters at Waseda University, she began her job hunt looking for an editorial position, a literary agent recognized her writing talent and hired her to begin writing an online book review column even before she graduated. Miura made her fic Shion Miura (1976–) , daughter of a well-known Japanese classics scholar, acquired her love of reading at a very young age. When, as a senior in the Faculty of Letters at Waseda University, she began her job hunt looking for an editorial position, a literary agent recognized her writing talent and hired her to begin writing an online book review column even before she graduated. Miura made her fiction debut a year after finishing college, in 2000, when she published the novel Kakuto suru mono ni maru (A Passing Grade for Those Who Fight), based in part on her own experiences during the job hunt. When she won the Naoki Prize in 2006 for her linked-story collection Mahoro ekimae Tada Benriken (The Handymen in Mahoro Town), she had not yet reached her 30th birthday—an unusually young age for this prize; in fact it was her second nomination. Her novels since then include the 2006 Kaze ga tsuyoku fuiteiru (The Wind Blows Hard), about the annual Ekiden long-distance relay race in which universities compete, and the 2010 Kogure-so monogatari (The Kogure Apartments), depicting the lives of people dwelling in an old rundown wooden-frame apartment house. In 2012 she received the Booksellers Award for the novel Fune o amu (The Great Passage), a tale about compiling a dictionary. A manga aficionado, Miura has declared herself a particular fan of the "boys' love" subgenre about young homosexual encounters.